POOL IS COOL strives towards the re-introduction of public outdoor swimming in Brussels. 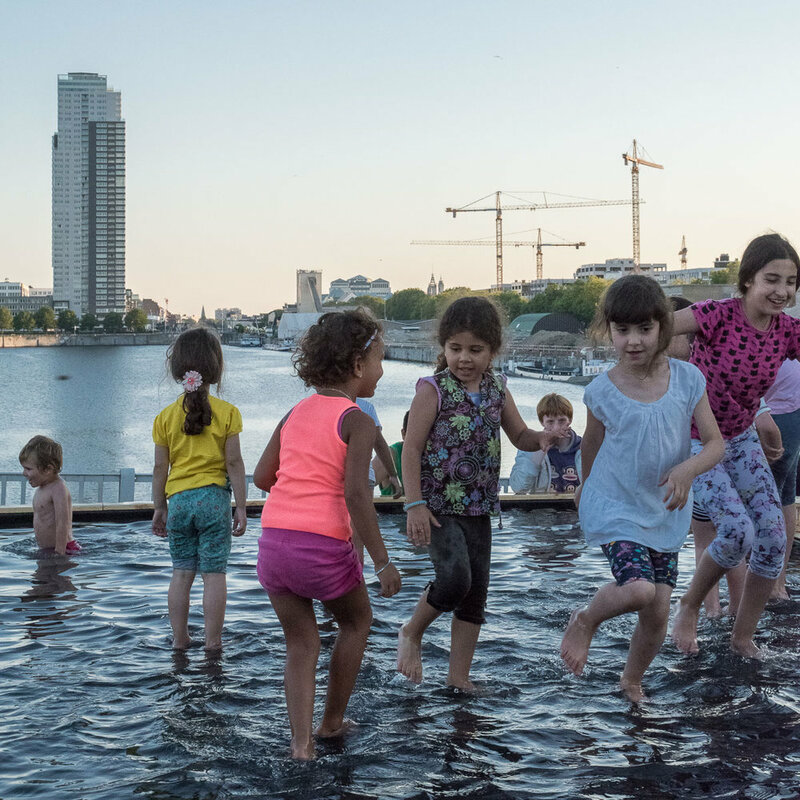 We are doing so through actions in the public space that raise awareness, research of underlying spatial, technical, administrational and cultural questions and the realization of real life swimming installations. 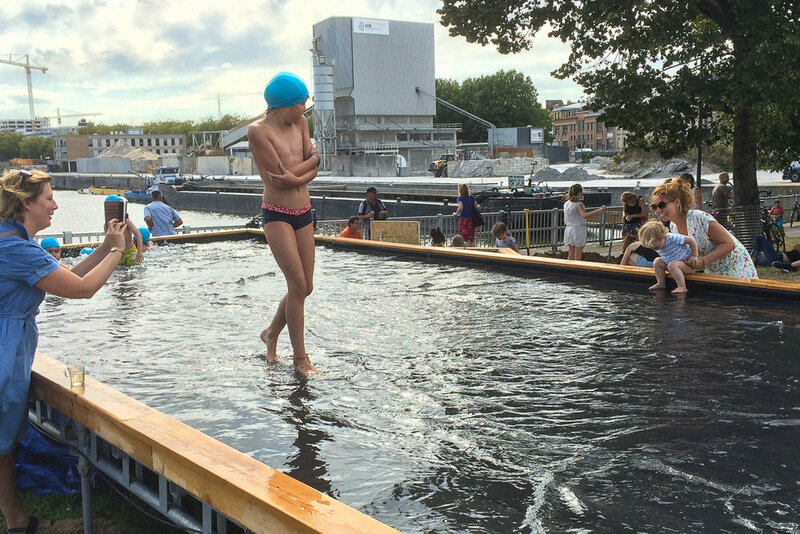 Showing that there is a big urge for outdoor swimming by all citizens of Brussels. Proving that outdoor swimming has the power to bring different people together, bridging gaps of today’s society, offering a place for everyone. Tackling open technical and administrational questions, gaining experience for future temporary or permanent realizations. BADEAU was the first swimming experience by POOL IS COOL, realized in August 2016. 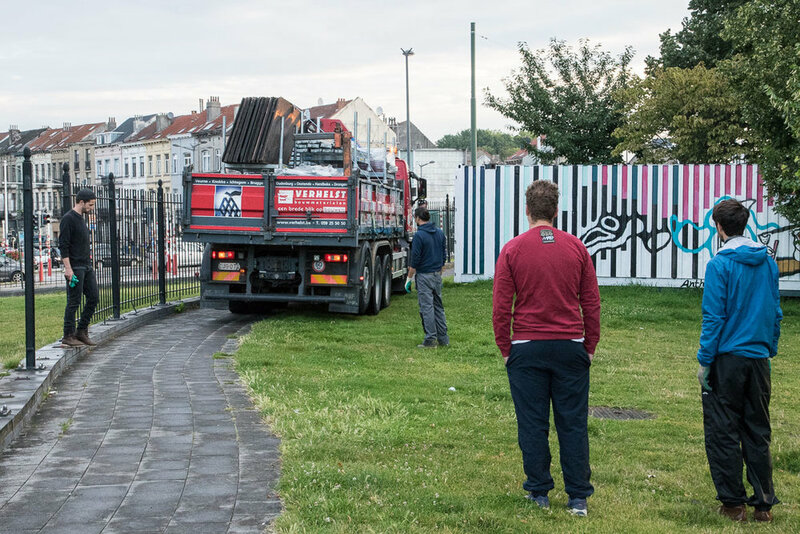 It became possible thanks to the funding by the City of Brussels, the friendly welcoming by „Au Bord de l’Eau“ and so many enthusiast companies and volunteers who supported us with material, work force and their spare time. BADEAU was realized at the “Monument voor de Arbeid” at the harbour of Brussels. This harbour is a wider part of the canal that connects Charleroi through Brussels with Antwerp. 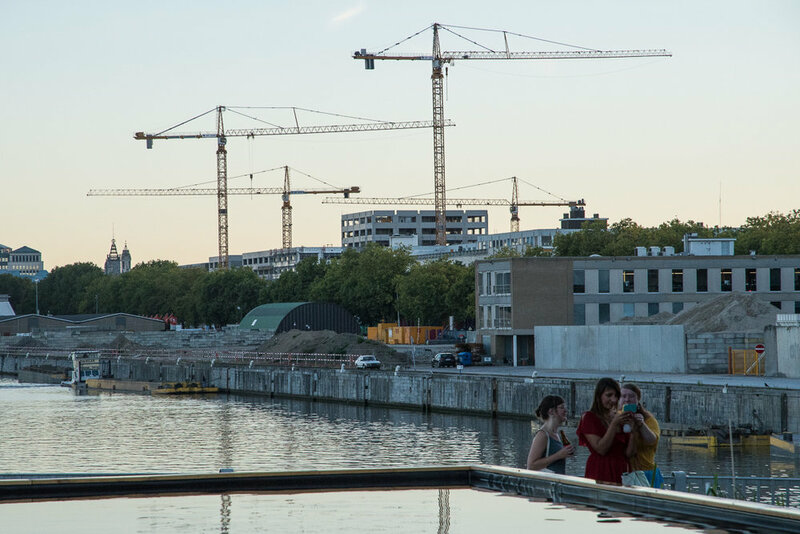 The place offers a fantastic open view over the canal and Brussels, still it was unknown to most people. The public space around the monument was closed off by a fence to protect it from vandalism, at the same time detracting it from public access. 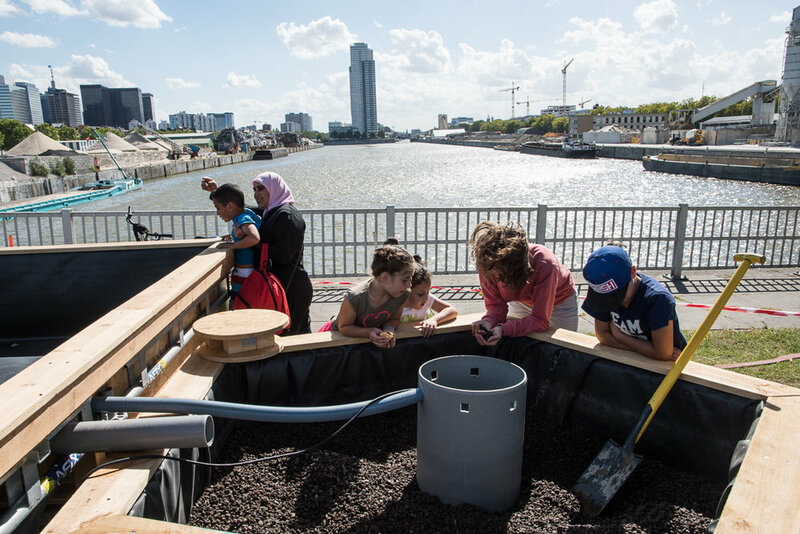 In 2015 the site became “Au Bord de l’Eau”, initiated by the association „Public vzw“. 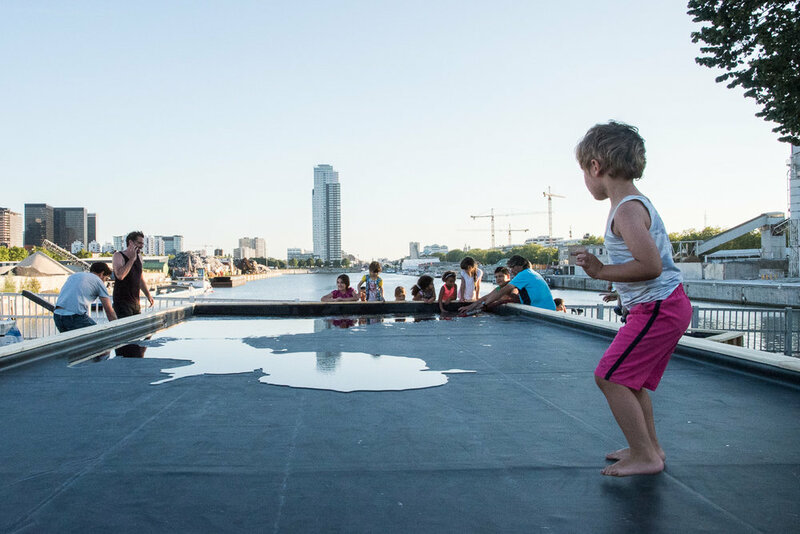 Au Bord de l’Eau took away the fence, provided a bar, simple furniture and a bouncing castle, giving the place a new open and joyful identity. 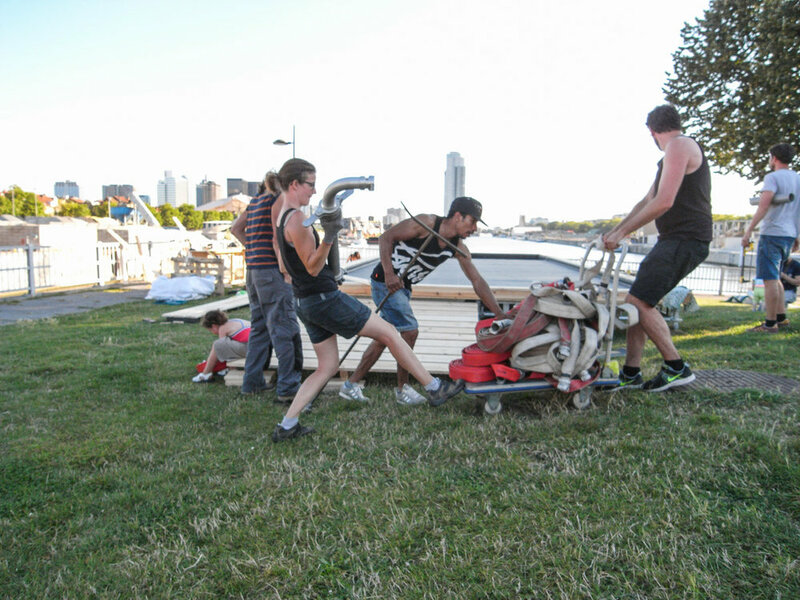 Together with a mixed programmation of events, Au Bord de l’Eau became the place to gather for leisure activities in the neighbourhood. It is an iconic site both on the scale of the neighbourhood and the scale of Brussels as a whole. It is situated amidst a poor area of the city where a pool and surrounding summer activities mean a lot for the citizens who often can’t afford holidays or even a trip to the sea. We have great personal relations with the people behind Au Bord de l’Eau and trust in their capabilities. We could benefit from the existing infrastructure (electricity, bar, etc), volunteers and cultural program. Despite the limited budget and preparation time the installation should provide serious water pleasure, representing the high ambitions of POOL IS COOL. It should work on the scale of the site while referring to Brussels as a whole. The water of the pool should be filtered naturally without chemicals, based on existing principles for swimming ponds. We’re convinced that this is the most affordable and sustainable way to clean the water, on large but also small scale. The installation must be easy to build and to disassemble, without earthworks and without the use of heavy machinery. The materials and technical installations should be reusable for future projects. A first quick collage illustrating the idea of a pool with a view on the harbor. The small pool was aligned with the huge harbor bassin. The position of the pool was aligned with the large harbour bassin of the Vergotedok. This caused a slight misalignment on the site while linking the installation subtly to the greater scale. Looking over the pool towards the dock it visually became one water surface, hinting to a possible future of the canal as a swimming place. The light structure of BADEAU, made of scaffolding material and wood, could be constructed without heavy equipment. The design had to cope with the sloping ground during building process. Therefore the installation consisted of two independent elements: pool and filter, the positions relative to each other could be decided on site. Adjustable feet of the scaffolding structure allowed the adaptation to the varying heights on site. The pool itself had a smaller but deeper part, ca. 50 cm, where kids could swim and dive, and a shallow large deck, ca. 3 cm, that became a water playground. Thanks to the black waterproofing the depth of the water was obscured and the difference between the parts was hardly visible. It appeared as one continuous swimming pool with a surface of 4 x 10 m.
The waterproofing was made in black EPDM rubber, normally used for garden ponds. The weight of the water fixed it to the ground, avoiding the EPDM to be glued to the underlying surface. That allows us to reuse the waterproofing in the future. To close of the deeper part of the pool at night we made two platforms in wood that served as entrance ramp for the pool during the opening hours. First idea for dimensions and structure. The water from the pool flows over through openings in the shallow deck and into the filter, seeps through the gravel and is collected in drainage pipes that lead to the pump. From there it’s pumped back into the pool. The playing kids in the deep part guarantee a mix of the cleaned water with the existing water in the pool. An evaluation of the water quality after the first days lead to the installation of an additional UVC light. This light kills bacteria and algae without chemicals and without disturbing the biotope in the filter bassin. This additional measure was necessary due to the small amount of water, only 7 m3 in total, which made the pool prone to changing values in water amount (playing kids spilling water over the edges) and water temperature (the shallow part served as solar heating) which have an impact on the water quality. 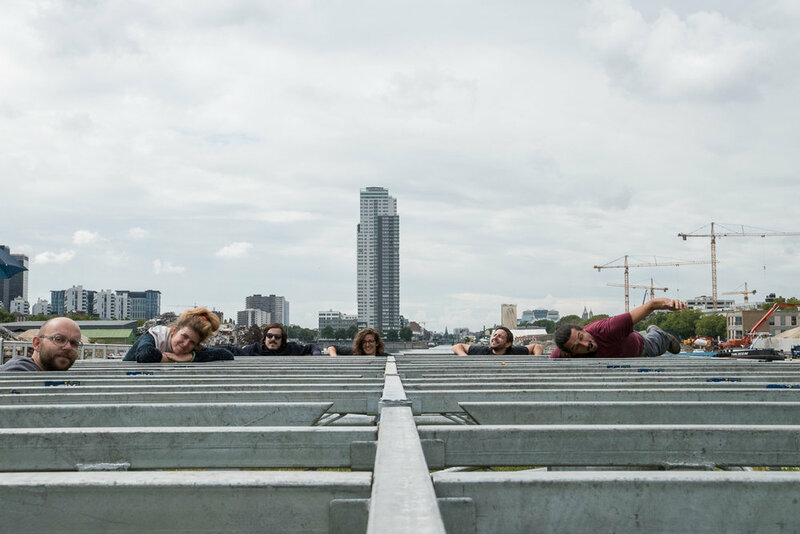 The construction process started with the preliminary measuring of the heights of the terrein to define the correct scaffolding elements. The pool was constructed in only 4 days, with the substructure in place at noon of the first day thanks to the simple scaffolding methods. The works comprised the wooden pool walls and deck on top of the scaffolding, the filter bassin made of wooden pallets, placing and gluing of EPDM as waterproofing and the installation of the technical equipment. All these works were done by members of POOL IS COOL and additional volunteers to gain hands-on-experience. 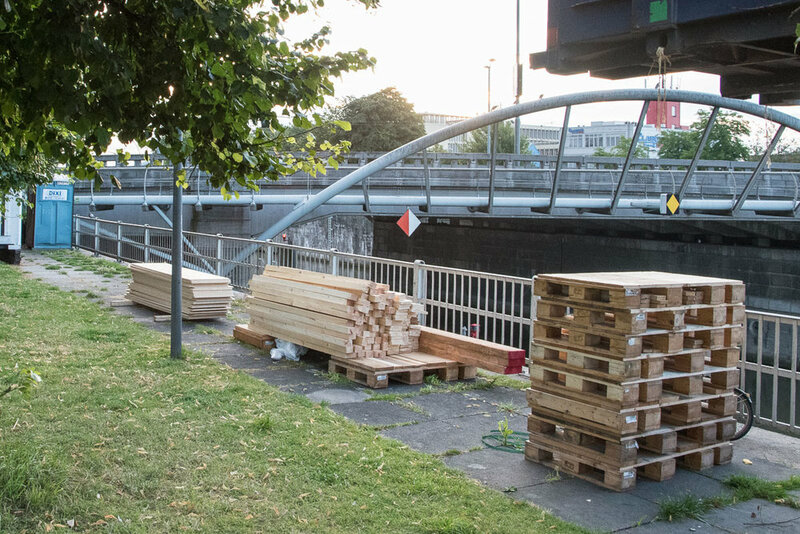 Construction materials were partly provided by companies that are situated in the industrial zone around the harbour. The Harbour of Brussels itself foresaw the necessary hoses and water connections to fill the pool with fresh drinking water. Regarding the materials and construction of the filter we were supported by professionals on the field of construction of pools and pool equipment. The pool was open for 3 weeks. During that time only minor adaptations were necessary. The dismantling of the installation took merely one day with the majority of material recuperated for future projects. BADEAU opened on 15/08/2016. From the beginning we were really luck with the weather, temperatures above 25° C were the average. The pool opened everyday from 2 to 8 pm. It required a daily presence of 2 people to run the pool which included the daily setup (opening, installation of ramps, shower and other equipment, cleaning of pool from floating dirt), technical routines (monitoring water temperature and preparation of laboratory tests, refill when necessary) and of course the service for the bathers like organisation of bathing shifts, distribution (and retrieving) of bath caps and individual showering. The amount of bathers was limited to 10 at the same moment. We introduced shifts of varying time depending on the pressure. Before entering the pool everyone had to disinfect their feet in a foot bath and had to take a shower. The foot bath was a small bassin in front of the entrance ramp, the shower improvised with a barrel with fresh water and an additional pump and hose. Swimming was only allowed in swimming clothes (there was a persistent wish, especially by older kids, to swim in normal shorts and t-shirt) and with a bath cap. The latter was provided by us and helped us to keep an eye on the amount of bathers. The amount of bathers fluctuated per day and over the time of the 3 weeks. There were people every day, at the most busy moments shifts were only 15 minutes with kids (and their parents) constantly waiting for 2 shifts ahead. BADEAU was a great success. Even though it was a tiny installation, it created the relaxed swimming pool atmosphere that we desired and that’s lacking in Brussels. People from all over the city came for a dip in the water at this rather remote place of Brussels. For some of the families BADEAU was obviously the only feasible option for refreshment this summer. Kids waited in long queues for their swimming shifts and screamed with excitement once they got into the pool. Parents thanked us for the initiative and effort. BADEAU was featured in local and national media both in French and Dutch (which is not self-evident, even in Brussels). Representatives of the whole political spectrum showed up and expressed their recognition of the problem of public outdoor swimming in Brussels. Still, BADEAU was only a drop in the ocean, the small and shallow pool could hardly bear the pressure of people urging for refreshment. On the level of ambition for the future it showed that the question of outdoor swimming must be addressed in a structural way and on a bigger scale. The reception in the media and by politicians makes us confident that BADEAU might have been only the first step of putting outdoor swimming on the political agenda with the importance that we think it requires. 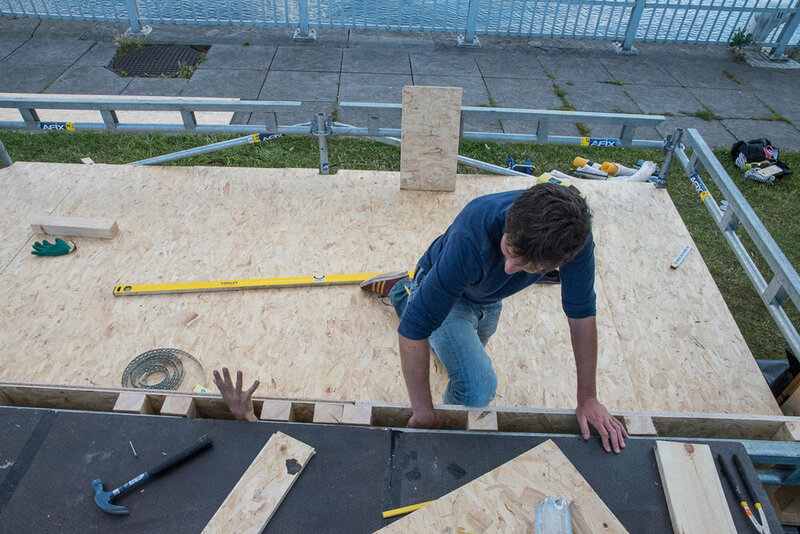 On a practical level we learned a lot on how to build and run a swimming installation. 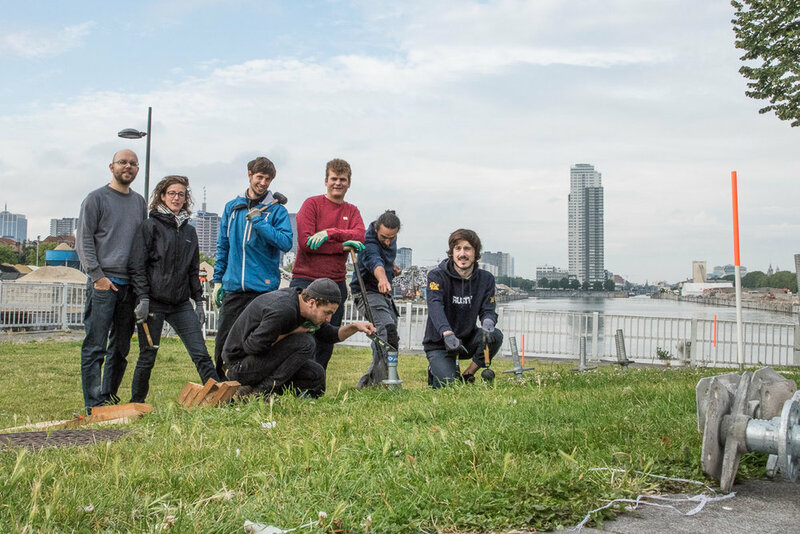 It’s important to note that this successful summer project was only possible with volunteers spending a lot of their free time for several weeks. The realization of bigger installations in the future will require decent funding not only for the construction itself but also for the work and time that is spent on such a project. In addition we will extent and improve our collaboration with institutional partners, especially for the exploitation and maintenance. BADEAU is our reference to build up strong partnerships for coming projects. 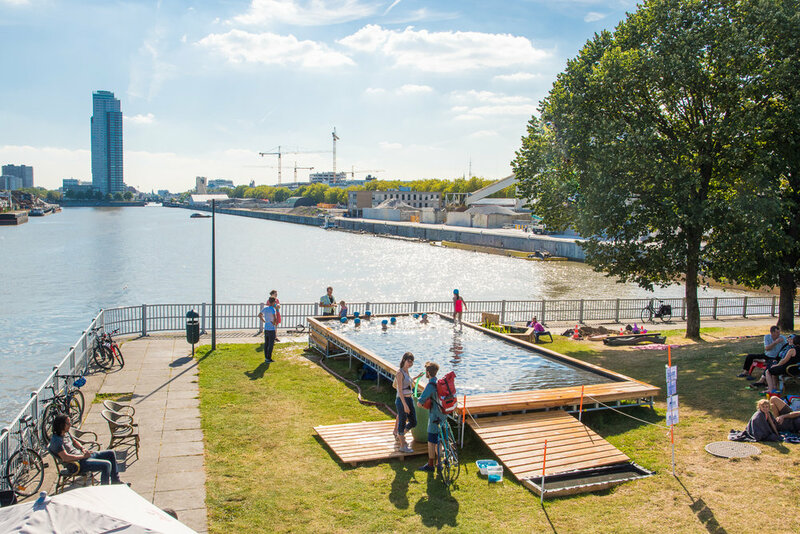 We’re already thinking of 2017 and beyond, so rest assured that POOL IS COOL continues to strive for the re-introduction of public outdoor swimming in Brussels!